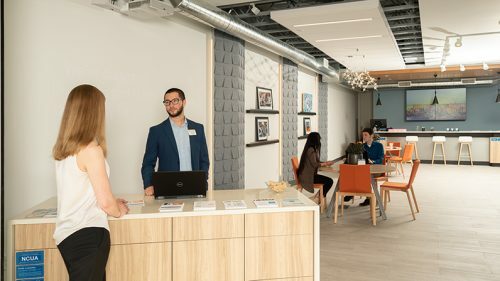 Seattle, Washington (March 7, 2017) – Momentum, a national plan-design-build firm, joined TwinStar Credit Union in celebrating the grand opening of their new 2,000 square foot branch in downtown Hazel Dell, WA. The project is based on a new flexible prototype branch delivery model that Momentum designed to support TwinStar’s branch expansion strategy of targeting diverse markets with customized retail environments. This Hazel Dell branch is in an urban area, and market research showed that the target demographic was more likely to use mobile banking for routine transactions. This led the design team to skip the teller pods featured in other TwinStar locations and focus the design around kitchen island and café style conversation zones that support low transaction volumes and a more personal environment for high value conversations. Another branch in Aberdeen, WA, opening later this year, demonstrates the flexibility of the prototype design. 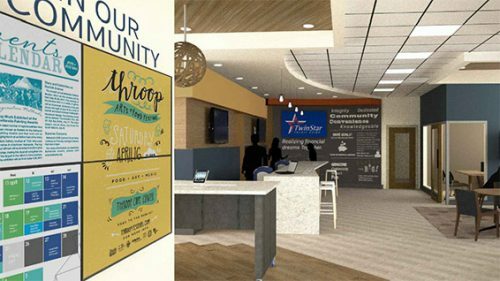 The Aberdeen branch is located in a small town and features teller pods to support the higher transaction volumes TwinStar experiences in the market. 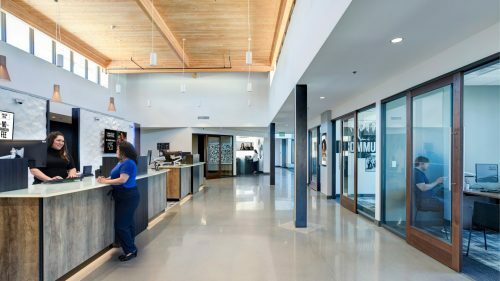 “The true branch of the future isn’t necessarily a flashy, modern design or self-service technology, but rather a design that truly understands the local community and helps a financial institution deliver greater value to their customer or member,” said Mark Alguard, Strategic Director at Momentum.